The main advice I have for people building a home gym is this. 1. Don't buy machines, and don't buy dumbbells unless you are too weak to lift an Olympic bar, in that case you can buy small dumbbells until to build the strength to start using a barbell, once you reach that point there is no need for any more dumbbells and in fact, I would go ahead and sell the dumbbells that you have and use that money to buy plates to put on the barbell. 2. Protect your floor against the strength you want, not the strength you have at the moment, I suggest you do what I did for my garage gym floor, get half inch thick plywood and put that down, then get 3/4" thick horse stall mats and put them on top of the plywood. 3. Don't save money on these 3 items, barbell, power rack, and bench, get a barbell rated for at least 1000lbs, get a bench rated for 1000lbs and get an adjustable power rack rated for 1000lbs, the bulk of the money you put into your gym should go into those 3 items. 4. If your an average person like me you will need to save money in somewhere, the plates are the best place to save money, you can spend a lot on plates if you want, but it's really not necessary unless you have an unlimited budget, I bought the cheapest plates I could find which are the CAP standard Olympic plates on amazon.com for around $45, they are perfectly good for what they are chunks of iron. I have 7 years of trainingexperience without ever entering a globo gym. I build my homegym slowly over time and started with just 2 32mm dumbbells and 1 32mm 150cm barbell 😀 😀 😀 Now I have an olybar with bumperplates and a giant cage in the middle of my living room in a flat on the 4th floor 😀 I love it. Hey, what about preacher curl, leg extension, and calf raise machines?? Dont these guys know how important machine cicuit training is? SS are just a bunch of sneaky conmen trying to get rich off of 405# squats and B&R Bar sales. I see a lot of mention of the Ohio Power Bar. Is there a particular reason to go with that one instead of the B&R bar that Rip helped design? How thick each layer of the plateform? Recently scored 1227.5 pounds of iron weights for $100. Didn't mind spending $300 on a bar after that. 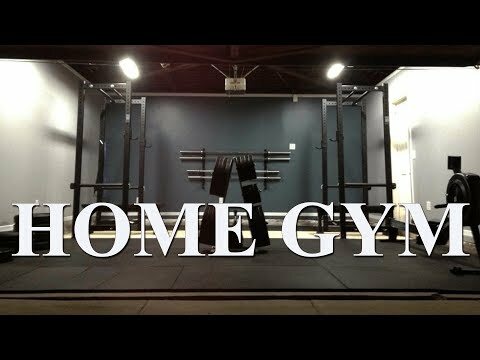 How to build a home gym: Go to home depot or lowes and get materials to build your own power rack, machines, etc. I've never understood why you need to go to great lengths to make a platform. I just purchased one very large sheet and placed it under the power rack and puts mats on either side for the deadlift. Why is it absolutely necessary to have a platform for deadlifts? Isn't rubber gym flooring good enough? Only thing I've got left to situate is my platform. My garage, like many others', has a slight grade to it. I believe it's about an inch every four feet. Any ideas about how to get the typical DIY platform, as seen in many YouTube how-to videos, level? At first I though of finding shims at my local Home Depot but at the minimum 4' by 8' I'm planning on making the platform, a shimming process seems complicated. Is there an easier way any of you have figured out? I am still using a 30mm bar after 6 years of training. I wonder if the Engineers from Prometheus have home gyms. This was the basic set up. I spent more on accessories (i.e. bumper plates, wood stain, DIY deadlift blocks) But listed above is my day in day out stuff. *Disclaimer on WF Athletic* It took them about two weeks to ship my order. I emailed twice after 1.5 weeks to put a fire under them, but I go my stuff for a good price. Why would we do 3 layers instead of 2? Mine is 2 as of now and I am trying to see the benefit of another layer. A home gym, the best money I’ve ever spent on myself. Living in the northeast, the weather is unreliable. I spent enough time waking up on frigid winter mornings at 4:30 to drive through perilous snow and ice to make it to the gym. It was either that, or go in the afternoon to stand in line for one of the two squat racks my local gym has. With my own facility, my commute time is 12 steps down into the garage 😃. When you consider the gas expense and the risk of an accident from driving to and from the gym day after day, the time you spend in the car, the time you spend waiting for a rack to open up, the time you spend searching for an available barbell or the plates that some inconsiderate person never put back on the weight tree, the advantages of having your own equipment are obvious. No need to plan your workout around what piece of equipment happens to be available when you step in the gym, no need to rush because someone else is waiting in line and you feel guilty taking a seven minute break before that big attempt. Now you have complete and total control over what you train, when you train, how you train, how loud you are, if and when you grunt, if and when you scream, if and when you slam the weights down on your platform after a big triumph. Blast music, train shirtless, step right outside of your garage and pee in the designated corner of the yard. It’s really a fantastic thing. My driveway is 50 yards long, straight and level, so I even have the good fortune of using my incredible top-loaded farmers walk implements I purchased from Dean at Black Widow Training Gear. Inside the garage, I have a Rogue RM-3 power rack, monolift arms (for benching), an Ohio Power Bar, Ohio Deadlift Bar, full-sized deadlift jack, a 6×8 platform (2 stall mats on the bottom, oak plywood in the middle, and stall mats again on the top), a Rogue Monster Flat Bench (with the beloved Fat Pad), a couple of weight trees loaded with milled vintage York plates, a pair of loadable olympic dumbbell handles I never use, and a couple pairs of collars.